The skull of an 800-year-old skeleton known as the Crusader, which was stolen from the crypt of an Irish church, has been found. Vandals decapitated the skeleton, which was interred beneath St Michan's Church in Dublin, during a break-in last week. 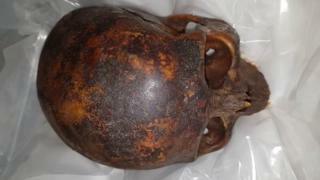 On Tuesday, gardaí (Irish police) said they had recovered the skull along with another stolen from the crypt. The crypt is a popular tourist attraction but tours were cancelled after the break-in. A Garda Síochána (Irish police force) spokesman told BBC News NI that the stolen skulls were recovered in Dublin but he would not give more details about the circumstances of the find. He merely said the items "were recovered as a result of information that came into the possession of the investigating gardaí". He added that National Museum of Ireland was "acting in an advisory capacity" during the recovery. St Michan's is a functioning church, which hosts regular Anglican services. Its crypt was badly damaged in last week's break-in and several of the mummies - including the 400-year-old remains of a nun - had been desecrated in the incident, according to the Church of Ireland. Crusaders fought in a series of religious wars known as the Crusades, which were sanctioned by the Church in the medieval period. There were seven major crusades as well as many less significant ones. The Crusader's body was turned over and his head was removed. A solid steel internal gate was also stolen. After it was confirmed that the skulls had been found, Church of Ireland Archbishop of Dublin Dr Michael Jackson said the emphasis would "turn to consideration of future security and display of the remains in the crypt of St Michan's". He described the remains as "a priceless part of the heritage of the city of Dublin and its citizens", according to Irish national broadcaster RTÉ. The crypt was previously vandalised in 1996, when a group of teenagers broke in and took a number of mummified bodies from their coffins. At that time, the Irish Times reported that the intruders dragged the corpses on to the ground and "seemed to be playing football with their heads".